I spent most of my time wandering art galleries and looking for public art in Philadelphia, but I don’t mind a little local shopping too. Steps from my hotel on Market Street, I was told there was a Macy’s that inhabited an old building in the city – the Wanamaker Building, which opened as the city’s first department store in 1866. So a dose of history while I shop – not a bad thing to me. This store is credited as not only the first department store in the city, but also the first to have electricity and to offer a refund policy to its customers. And thankfully, this building is still standing. But that’s not its only benefit of this building, which of course has the full compliment of department store offerings, its also home to an amazing pipe organ. 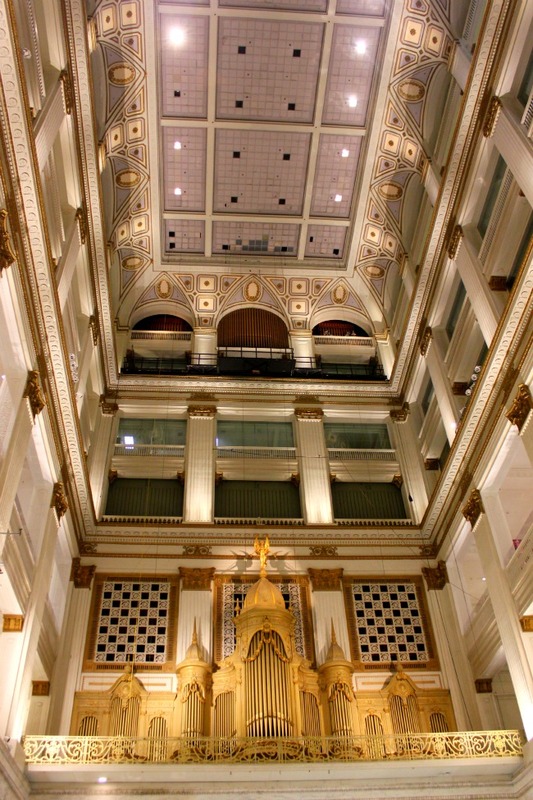 In 1909, building owner John Wanamaker purchased the St. Louis World’s Fair Pipe Organ and it was installed a few years later in the store. With almost 28,500 pipes, the pipe organ was recently restored, and can be seen in the central court of the building. Its a grand sight, with its tall gold pipes, this is National Historic Monument as well as being the world’s largest playable instrument. And for those who are lucky enough to be shopping, the pipe organ is played twice a day, a benefit for the locals, who can still hear the sweet sounds of their city’s history. What a find. Could you be the coolest person I know? I think that’s you Lorrayne!